There might be a few longer-than-usual pauses between second-round picks at Thursday night's NBA draft. That's because sources tell Page 2 that a handful of teams will consider choosing Chimezie Kudu, a 7-foot-11 center from South Africa who will likely become eligible for the draft Thursday morning. The late notification of Kudu's status is due to the recent discovery of a piece of paper found at NBA headquarters just last week. The letter, which was postmarked May 10, stated Kudu's intention to enter the draft. 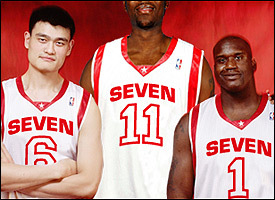 And you thought Shaq and Yao were tall! But because Kudu speaks a dialect of Hottentot, the letter -- written using the modern Latin alphabet -- was mistakenly thrown out by a high-ranking league official's assistant. A summer intern who studied Latin at Columbia University came across fragments of the letter in a recycling bin, loosely translated it and immediately notified NBA deputy commissioner Russ Granik. "This is an awful misunderstanding," said a league source, who did not want to be identified. "As far as we know, Mr. Kudu never followed up on his letter, though we are not entirely sure. It's very possible our switchboard hung up on him several times since he doesn't speak English."